In the Treatment Plan Module, you can manage and prioritize treatment plans for a patient. Preauthorization: Send Preauthorization for a procedure. Discount: Add a Procedure Discount to selected treatment planned procedures. Update Fees: For this patient only, update all fees and insurance estimates on the selected treatment plan. See also Fees Update. Print TP: Print the selected treatment plan. Default print options can be set in Treatment Plan Module Preferences. Email TP: Email the selected treatment plan. Sign TP: Electronically sign a saved treatment plan. Note: To customize the printed layout of treatment plans, see Treatment Plan Layout. The Treatment Plans list in the upper left corner lists all active, inactive, and saved treatment plans for this patient. The default procedures in the Chart module Progress Notes. The default procedures drawn on the graphical tooth chart. The default procedures when creating an appointment for this patient. The default procedures when creating a planned appointment or scheduling an appointment. Inactive: There can be multiple inactive treatment plans. Procedures on inactive plans can have a status of Treatment Planned (TP) or Treatment Planned Inactive (TPI). An inactive treatment plan can replace the active treatment plan at any time. Simply double-click the inactive plan, then click Make Active Treatment Plan. Saved: Save a treatment plan so you have a permanent record of it. This is the only way to preserve a treatment plan since completed procedures will be removed from active and inactive plans. Fees in saved treatment plans are not affected when updating fees. To save all procedures in a plan, select the treatment plan then click Save TP. To only save certain procedures in a treatment plan, select the procedures, then click Save TP. To always save treatment plans as PDF files, see Treatment Plan Module Preferences, Save Signed Treatment Plans to PDF. Only saved treatment plans can be signed. Saved treatment plans reflect the insurance information that was present on the date the treatment plan was saved. New Treatment Plans: Treatment plans can be created from this module or from the Chart module in Treatment Plan view. To create a new treatment plan from here, click New TP. Estimates as of: This date picker only shows if Frequency Limitations is enabled. Use this feature to calculate insurance estimates, as of a certain date, for treatment planned procedures that have frequency limitations. Click the dropdown to select the date, then Refresh to update calculations based on the date. Refresh: Refresh treatment plan and deselect any highlighted procedures. +Plan Appt: Create Planned Appointments. Show: Options selected on the Show tab affect what shows in the Procedures grid and printed/emailed treatment plans. Graphical Completed Tx: Show completed treatment plan procedures on the printed Graphical Tooth Chart. Set the default in Treatment Plan Module Preferences. Use Ins Max and Deduct: Indicate when a patient's insurance maximum or deductible has been applied or reached. Only visible when patient has insurance. Fees: Show or hide all fee information. Insurance Estimates: Indicates PPO or allowed fee, primary and secondary insurance estimates, and patient portion, if the patient has insurance. If the patient has a discount plan, it shows the discount (DPlan) and patient portion. Checked by default when patient has insurance or a discount plan. Discount: Show procedure discount amounts. Can only be checked if there is a discount or write-off in one of the treatment planned procedures. Subtotals: Show Subtotals for each priority level. Totals: Show Totals at the bottom of the grid. To set other options that determine what shows on printed treatment plans see Treatment Plan Module Preferences (e.g. show itemized fees or grand total). Sort by: Procedures are always sorted first by priority, then by date. It can further be sorted by tooth number or order of entry. Also see Procedure Sort Order. Set the default in Treatment Plan Module Preferences, Sort Procedures By. Printing: Only shows if patient has a treatment plan that was saved prior to version 17.1. Offices who switched from internal treatment plan sheet to custom sheet should check the box for print classic if they want to print the treatment plan as it would have prior to 17.1. The box at the upper right shows all preauthorizations for this patient. Double-click a preauthorization to edit. When you click on a treatment plan, the associated procedures show in the Procedures grid. To highlight multiple procedures, press Ctrl and click on the procedures, or click and drag. Double-click a procedure to open the Procedure Info window. Abbr: The procedure code abbreviation. Discounts: Any discounts applied (procedure discounts + any PPO insurance plan write-offs). Not an option if the UCR fees match the PPO fee. Done: An X indicates a procedure is completed (saved treatment plans). DPlan: Any discount applied as a result of an in-house discount plan (UCR fee - discount plan fee). This column only shows when insurance estimates is checked under the Show tab, the patient has a discount plan, and the DPlan display field is added to treatment plan module. Fee: The fee charged for the procedure. Allowed: The PPO fee for PPO plans or the allowed fee for out of network plans. Pat: The estimated patient cost. 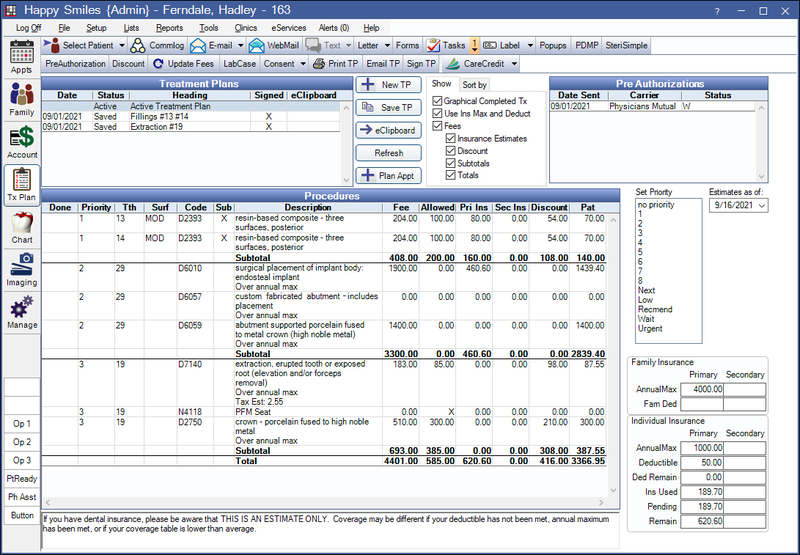 Pri Ins: The insurance estimates for the insurance plan listed first in the Family Module. Priority: The procedure's priority level. Prognosis: The prognosis assigned to the procedure on the Enter Treatment and the Procedure - Misc Tab. Sec Ins: The insurance estimates for the insurance plan listed second in the Family module. Sub: An X indicates the procedure uses a substitution code in Lists, Procedure Codes. The pri and sec ins estimates can be misleading if, in the Family Module, the patient has a dental plan listed first and a medical plan listed second. In this particular situation, the Pri Ins column will show the dental plan estimates, and the Sec Ins column will show the medical plan estimates. We recommend listing the medical plan first in the Family Module. The set priority list is used to assign priorities to the procedures on the treatment plan. Select the procedure(s), then click on a priority level. The sort order of the procedures will change accordingly. Priorities can also be set while entering treatment in the Chart module, and on the Procedure Info window. Priority options can be customized in Definitions: Treat' Plan Priorities. You can use numbers, letters, or words up to 7 characters. You can change the sort order of procedures according to priority, change text colors, and hide priorities from view. Examples of other possible priority levels are Sched, Wait, Next, ?, Decline, Last, Low, High, NewYear, Urgent, WaitIns, Altern, Plan A, Plan B, RecPlan, and AltPlan. The area at the lower right shows remaining family and individual insurance benefits at a glance. For details about how amounts are determined, see Insurance Remaining Calculations. The default note is set in Treatment Plan Module Preferences. Any changes made to the note here will be saved for the selected treatment plan. Right-click to add Quick Paste Notes. There are a few ways to update fees in active or inactive treatment plans (e.g. if fees have increased/decreased or insurance plan or fee schedule changed). Update Fees button: Update fees for one patient at a time. Designed to be used during the regular six month exam if there are procedures from the last exam which have not been completed and fees are outdated. Global Fee Update in Fee Tools: Update fees in all active and inactive treatment plans at once. Fees in saved treatment plans are not affected when updating fees. Treatment Plan tooth chart shows a black box when printing or emailing. In the main menu, click File, Graphics, and change the format.